Faasos is a leading food ordering and delivery service based out of India, that allows customers to get home delivered dishes from breakfast to their main meal of the day, from 9am all the way to midnight. The service can be easily accessed from the website or by using their mobile apps for iOS and Android. What makes it a particularly worthwhile choice is the fact that you can make savings on your orders by using special Faasos coupons. We update our list of these whenever new offers and deals are made available, so be sure to check back before ordering to ensure you get the best possible deal! Terms & Conditions: - Cashback will not be received in case order is cancelled. - Not applicable on combos and beverages. - Min order value should be Rs.400. - Maximum Cashback up to Rs.400 - Can be redeemed more than once. - Minimum order amount Rs199 - Max discount upto Rs100 - Valid only on 'Classic Faasos' section. - Not applicable on combos, beverages & MRP products - Cannot be combined with any other offers. - Can be redeemed multiple times. Faasos was launched in 2011 and has quickly grown to one of the most popular food delivery services in India. They cater to 15 different cities, make 30,000 meals a day, and have served over 4 million customers in 5 years! The founders wanted to answer a simple question that many people ask themselves every day. "What shall I eat today?" 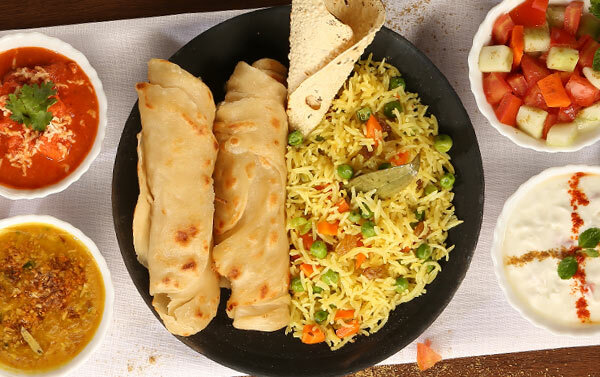 (Or in Indian #AajKhaneMeinKyaHai) And with a menu that covers breakfast, Indian and South Indian meals, Chinese, and Rice and Biryani combos, the customer has the perfect selection of choices, all waiting to be promptly delivered to their location. What's more is new items are added all the time, so you never know what you might find! Using Faasos couldn't be easier. Simply download the appropriate app (iOS or Android) to your smart mobile device or go straight to the website using your browser and hit the Order button. You will then be able to select your city and enter a more specific location. This includes Bangalore, Mumbai, Coimbatore, Pune, Chennai, Gurgaon, Ahmedabad, Vadodara, Hyderabad, New Delhi, Indore, Bhopal, Vizag, and Nagpur. The system will the return the menu options that are available to you and their prices. All food is prepared locally to ensure you get the fastest possible delivery. You can choose anything from the menu (meals, desserts and snacks) and add them to your order, then there's a simple checkout process that allows you to pay online using your credit card and a few other methods. Prior to making payment you should see a special promo box. This is where you can enter any Faasos promo code to redeem its corresponding offer. If enter correctly you should see a confirmation message and your order cost or other terms will be updated to reflect the offer. We keep an up to date list of all Faasos offers, so you don't have to waste time searching elsewhere for something that will work. It is also a good idea to follow the company on social media (including Facebook, Twitter, YouTube, and Instagram) where they will also let you know about the latest Faasos coupons. You can also keep updated with their company news, such as when they're launching in new city etc. Once everything is finalized you can make payment and your order will be sent digitally to the kitchen, where staff will immediately begin preparation. Faasos orders are accepted from 9am all the way until midnight, 365 days a year. As long as you place your order during operating hours, it should be delivered within an hour. Using their app you can track the status of your order in real time, so you know exactly where along the chain it is. They use their own fleet and drivers, so everything can be easily monitored. Once your food is delivered you can also see that the order is finalized in the app. You can even make payment in cash, by giving it to the delivery driver if you don't want to pay online. All of your orders will be listed in your online account, which takes only a few minutes to register. If you have a problem with your order, such as items missing or the wrong order altogether, you can find their contact information on the site and app. You may also want to contact them if the delivery is late. Their staff are always on hand to make things right. If they agree to a refund you can expect to see it in your account with 5 to 7 working days. There are a number of ways you can make savings while using Faasos. A basic Faasos promo code can be used during checkout. You can find all of the up to date codes right here. This may get you money off the order, free snacks, free delivery or other offers. Depending on what's available at the time you may be able to use a Faasos coupon code for Rs 100 or 50 off, a first order discount, buy 1 get 1 free, and many others. These are constantly changing so once you find a code, use it quick! You can also take part in their referral program. For this you will be given a special referral code, which your friend must enter when they make their first order. This will then register as a referral and qualify you for Faasos credits, which you can then redeem for discounts. Faasos now also run an elite loyalty program, which is offered to regular customers. If you sign up you will be eligible for a number of exclusive perks, such as the ability to pay later, even faster delivery, exclusive Faasos offers that you won't find anywhere else, and previews of items that will be making their way to the menu soon. Love all things Faasos? Then why not check out their buzzing blog, which is located at WeGotYourFood.wordpress.com - Here you will find recipes, food related articles, top 10 lists, health and diet tips, and lots of other interesting information. Their Instagram account is also great for checking out real images of their meals, which are all cooked with the freshest possible ingredients. You can also learn more about Faasos on their Youtube account, which features commercials, guides, media appearances, and fun animations. Get inspiration and find out on what food you want to spend your Faasos coupons!